By injecting a new formulation of immunotherapy directly into tumors, scientists eradicated cancer in 97 percent of mice. T	T	he human immune system is armed with specialized white blood cells — T cells, B cells, natural killer cells, and more — that target and kill invading viruses, bacteria, and other pathogens. Cancer cells, however, use signaling tricks to suppress the body’s natural immune response, sidelining T cells while a tumor grows unchecked. For decades, scientists have been chasing a cancer “vaccine” that wakes the sleeping army of immune cells and trains it to attack cancer. Now a new technique has scientists injecting microdoses of immune-boosting agents directly into cancerous tumors, which appears to not only kill the targeted tumor, but eradicate similar tumors elsewhere in the body — at least in mice. 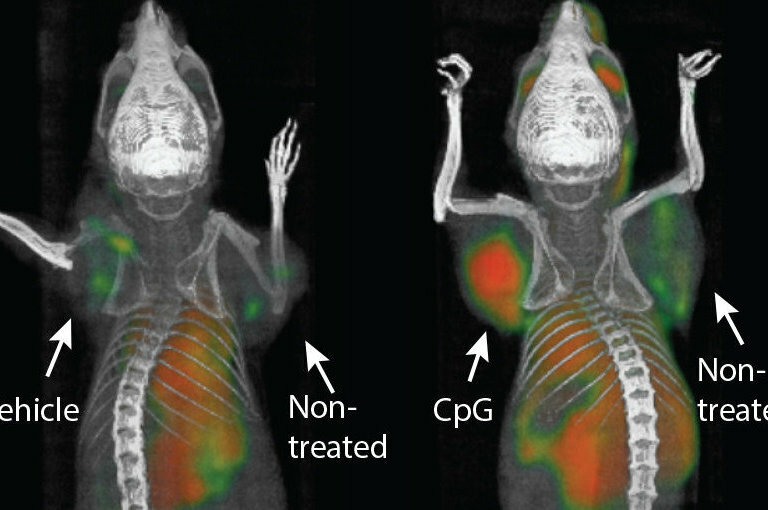 In a preclinical study published in Science Translational Medicine, 90 mice with multiple transplanted tumors were injected with two immunotherapy agents, and in 87 cases, all signs of cancer were wiped out. The promising results, reported by Ronald Levy at the Stanford University School of Medicine, provide further hope that immunotherapy is the future of cancer treatment. Instead of bombarding the body with high doses of toxic chemicals and radiation, we can recruit our own immune systems to fight back. In Levy’s two-step cancer vaccine, a short stretch of DNA called a CpG oligonucleotide was first injected into the tumor site. CpG is something called a Toll-like receptor, a special kind of immune system protein that recognizes invading pathogens. When micrograms of this protein (millionths of a gram) were injected into the mouse tumors, they activated the expression of a receptor called OX40 on nearby T cells that had originally swarmed to the tumor site, but had been rendered inactive. The second injection contained an antibody that attached to those newly activated OX40 receptors and essentially turned the T cells back “on.” Before their activity was suppressed, those same T cells were primed to respond to the precise antigens produced by the tumor. With a boost from the vaccine, now they were back in action. The mice in the Stanford experiment were transplanted with lymphoma tumors, but Levy said in a statement that the vaccine achieved similar results with breast, colon, and melanoma tumors. Even more impressive was that some of the reactivated T cells circulated throughout the body and attacked tumors far from the injection site. Levy was referring to other emerging immunotherapy cancer treatments like CAR-T therapy, in which a patient’s T cells are removed and genetically altered to carry custom-made antigen receptors for the patient’s particular type of cancer. And checkpoint inhibitors, a therapy that targets specific immune system proteins that allow cancer cells to hide in plain sight. Another promising immunotherapy uses the listeria bacteria as a vector to deliver tumor-specific antigens to the entire immune system. The listeria technique was developed by Yvonne Paterson at the University of Pennsylvania School of Medicine and has been licensed by Advaxis Immunotherapies, which is already testing its vaccine formula in phase 3 human trials for certain types of late-stage cancers. The Stanford team just began recruiting its first 15 human patients. One disadvantage of the direct-injection technique, said Paterson, is that it’s limited to tumors that are easily accessible. Levy is a pioneer in the immunotherapy field, winning FDA approval in 1997 for the first lab-designed antibody to be used in conjunction with traditional chemotherapy. But Levy is not the first to experiment with immune-boosting vaccines that target T cells closest to the tumor site. RELATED: Who Should Decide If Gene Therapy Is Too Risky, Patients or the FDA? Cornelis Melief, head of the department of immunohematology and blood transfusion at the Leiden University Medical Center in the Netherlands, is referenced in Levy’s paper for his work with T cells using different formulations of antibodies. In an email, Melief called Levy’s new approach “very elegant,” notably for its accurate targeting of the tumor type and low chance of dangerous side effects like an autoimmune response. “The beauty of this therapy is that one does not need to know the nature of the antigens in the tumor, and that local immunotherapy generates systemic therapeutic action thanks to the circulating T cells,” wrote Melief. If the human trials are successful, Levy envisions a day when the vaccine may be injected into solid tumors before surgery so that the immune system can be inoculated against the cancer spreading elsewhere in the body. WATCH: What Does A Cancer Cell Look Like?